Huh, for some reason I thought this book was about something entirely different. So, no, I won’t read it after all. I’m pretty sure I will not enjoy this as I will only be distracted by this point you mentioned. Which brings me to the fact about how talented a writer Marilynne Robinson really is. Gilead being epistolary, you will never get that feeling with the book. At all. Would you agree it is kind of masterful to be able to describe to a reader what you want to convey but at the same time make the letters and voice convincingly real? Gilead’s plot might not be as gripping as Kevin’s, but it definitely is great writing, and so subtle you won’t even know how good she is until after you’ve contemplated on it. I loved this book – it is just so thought provoking. I can’t believe that Lionel Shriver has never had any children, as the emotions she explains are just spot on. I’m actually reading her book Post-Birthday World at the moment. I’m really hoping it is as good as Kevin. I’ve been meaning to read this book, not just because i’ve heard such good things about it, but because I am curious how she handles the narration. After reading your comments, I’d really like to see what I think. Did you read the New Yorker article on psychopathy a few months back? It was really interesting! @ charley: For a long time I thought this book was about having an autistic child – I have no idea why! Clearly, I was wrong! @ claire: This is definitely one of those books that was a great story but it was a shame about the writing. I don’t regret having read it, but I do wish certain things had been executed better. I’ll be really curious to read Gilead and compare it to this, as it sounds like the two books are complete opposites! @ Jackie: I’ve heard good things about The Post-Birthday World; I look forward to your thoughts! I picked this one because it was the cheaper option at the used bookstore. I am not sure how I feel about tackling TPBW now – elements of Shriver’s writing really bugged me (not just the letter format, but her actual style – why such pretentious, convoluted language at times, Ms. Shriver? ), and if the story and the underlying material hadn’t been so good, I’m not sure that I would have liked the book at all. I agree she was so insightful and asks really interesting questions… maybe if TPBW doesn’t have a first-person narrator I won’t be so annoyed by her literary tics? 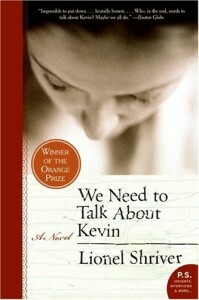 @ verbivore: Shriver doesn’t completely fumble the narration here, but I would say it is the novel’s weakest element. As I said, there is something that occurs later on that might mitigate some of the letter format’s clunkiness, but it didn’t wholly excuse it in my mind! I didn’t read the New Yorker article… I’ll have to check it out! what a literate review! i admire how you point out the good and bad–and SUPPORT your opinions. i think that some bloggers confuse book reviewing with plot retelling. many end up regurgitating the plot without really reviewing the book for literary merit. i understand that a synopsis should be included, but don’t just give me the story line! @ nat: Thanks for the kind words! I personally dislike book reviews that go on and on about the plot, because I can find that stuff out for myself simply by looking at a book’s back cover. I suppose my approach to book reviewing is to make sure it doesn’t come across as a book report. I agree that a synopsis (brief!) is necessary to ground the reader, but I like my reviews to be an account of how I responded to a book. I’m glad you found this one helpful. I had never heard of this book but the subject caught my attention. I think it ives a different perspective on a very difficult subject; books and articles often write about the victims and their families, but less often about the “other side”. I find the epistolar approach one of the most difficult to fake in litterature; the exemples you pointed out in this book are good exemples why! It’s hard to stay true to the genre while writing in a way that the readers won’t get lost in details they couldn’t know otherwise. I can see how a somewhat unreliable narrator would be more appropriate in telling this type of a traumatic story. Imagine the emotional turmoil afterwards and the whole psychological distortion that preceded the tragic event, what the narrator tells might be an aspect of truth but not the whole truth because nobody might perceive what really goes on. My heart is beating hard while reading your thoughtful review because I’m afraid you might give it a lower rating than a 4, as I have heard mixed reviews about this book. @ kittykay: Yeah, I was really intrigued by Shriver’s examining the other perspective in these types of tragedies – it was one of the things that really kept me riveted! You have a good sense of how the victims’ families will react, but what about the family on the other side? And yes, the epistolary format is clearly a tricky little animal – I think you need a really good premise to pull it off. @ Matt: I went with a 4 because even though the book had its faults, I ultimately really enjoyed it. It might not be storytelling at its finest, but there was a really awesome story being told, and that counts for something in my book. I really connected with the characters and I got completely sucked into the story and thought about it for a while afterwards, so even though it had problems, I thought it was a worthwhile read (and not just for me, but for others!). I think you point out the book’s faults accurately. I wasn’t even sure I’d get past the first 90 pages until, well, I got past the first 90 pages and Kevin really gets evil. If nothing else, this is a story you’ll never forget. No ho hum plot here. Great review! This is a book I have heard a lot about, and I have always been intrigued by it. I think that your review does justice to the fact that this is a really absorbing read, but not a flawless one. The fact that the writing is a bit sticky might actually push me over the fence and inspire me to try this one, for reasons I really can’t determine. Maybe it is just the curiosity factor. @ trish: I agree that the book really gets spicy once Eva has given birth to Kevin. You see the strain in her marriage before this (although this could be colored by the fact she’s got the benefit of hindsight), but once Kevin officially enters the picture things really do pick up. Definitely not a ho-hum plot! @ zibilee: I’ve read quite a few reviews of this book at this point and some people really do enjoy Shriver’s prose stylings, so I do think it’s worth trying it out for yourself to see how you feel. Some people find her unbearable, others think her writing’s divine… I fell somewhere in the middle. She veered on pretentious at times, but it wasn’t the actual words she used that drove me bonkers most of the time!